Home » Q & A » Q&A: Have You Reviewed the (Latest Handgun Safe)? Q&A: Have You Reviewed the (Latest Handgun Safe)? Hornady Rapid Safe and RFID Bracelet used to open it. Have you reviewed the Hornady Rapid Safe, gun safe yet? I haven’t reviewed that particular model, but it falls into the category of small gun safes with un-rated electronic locks. Electronic locks that haven’t been verified by a professional and independent third-party like Underwriters Laboratory can have all sorts of problems. The videos on the small gun safe page show some models getting defeated by bumping them, paperclips, and drinking straws. Even if that particular model does not have such issues, the other major drawback of un-rated electronic locks is reliability. The Hornady Rapid Safe RFID bracelet concept seems to very similar to the RFID smart gun design that was just taken off the shelves in California. Ironically many of the people who buy the Rapid Safe would never buy a “smart gun” because of electronics reliability and other concerns. But you need to be able to open a gun safe to use the gun inside, so it’s just as important. Even UL 768 listed electronic safe locks have a habit of failing every 5 to 10 years. I use a pump shotgun or a 1911 for home defense because these are 100 year old designs that have proven their reliability. Even so, at my last defensive pistol event my pistol (a 1911) had two failures to fire because I hadn’t cleaned the firing pin cavity in a while. Many things can go wrong when the pressure is on. To keep a reliable defense gun in an unproven and untested electronic gadget defeats the purpose of using a reliable gun. Since most people use small gun safes for quick access home defense, that’s the last place you want to have an issue. A robust old fashioned pistol box is a better choice for most people than the latest fad in handgun safes. At the end of the small gun safe article I make some handgun safe recommendations that are more reliable and proven. The models I recommend also have hundreds of owner reviews that you can look through. 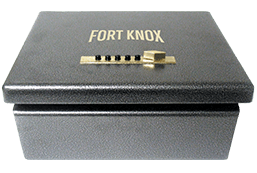 Small electronic gun safes are big sellers and many people buy them. With that said, my site seems to attract people who buy these items, have problems with them, and then go looking for better answers. Thanks for your reply. You are right on all accounts and i’m sure i speak for most of your visitors when i say your work is appreciated. Looking for a reliable small safe that is fool proof 100% of the time because it could mean the difference between life or death, is a daunting task. I’ll keep looking at your reviews before i make a decision or maybe i’ll have to make one myself with the locks you reccomend so highly. LOL. I agree with your review comments. While I think highly of Hornady products and also believe in free enterprise, this safe concerns me for several reasons. Relying on RFID devices is personally troubling. You have to have a card, wrist band, or key fob handy to gain rapid access. I can’t imagine fumbling around in the dark for one of those in times of duress and I can’t see being forced to sleep in jewelry so I don’t have to fumble if I need to. I’ve seen some video suggesting it will deter kids. Well, I think kids will find it much easier to get their hands on one of the RFID devices than to break into a combination type safe. Also, RFID cards fail all the time. All you need is to have your RFID device fail when you need it. Lastly, and this is the part that bothers me, but I still support Hornady’s right to free enterprise. We have states, like NJ and CA, trying to pass laws that would force all handguns sold in the state to be smartguns that use something like this type of RFID recognition, and right now, that seems to be the only technology out there likely to work (maybe also the magnets). I have the same problem with these less than smartguns that I have with this safe. I can’t personally see wanting to rely on that type of technology ever. I also think that kids will be better at defeating it than adults. So, this safe goes one step closer to giving self-righteous legislators the opinion that the technology is readily available and works so well that nothing else should exist, and that is scary. So, on one hand, I do basically believe that the market should drive whether or not products survive and don’t mind seeing this product out there for this reason. However, I am concerned that elected representatives out to make a name for themselves will abuse us all by trying to force this type of technology on us as the only type of technology allowed (boy – did you ever think we in the U.S. would reach a point where the government would force one and only one technology or business product on everyone? Too bad the Security Exchange Commission doesn’t get to weigh in on these things.). By the way, I saw a statement in another review article saying that this safe “represents the future of personal firearm storage”, which provides substantial credence to my concerns. Thanks for the great comment! 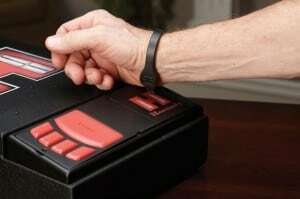 You covered a wide range of implications of these smart safes. Thanks for pointing out explicitly that our critiques are nothing against Hornady, whose ammunition, bullets, and loading equipment I’m very fond of. Your insight about technology adaptation is great; that your kids are generally going to be faster up the technology learning curve than you, so cutting edge security products hand them an advantage in defeating them. I share your concerns and am similarly dismayed at the dubious attempts to legislate particular product technologies. While I support free market innovation for those that want smart safes, personally I’ll stick with time-proven designs that work. Its a waste of money and surely not reliable in a situation where you would need your firearm. I’ve bought one at Academy Sports in Killeen, TX, mid July for locking up my pistol while on road trips, since we conceal carry and some places do not allow firearms in their establishments. The safe was programmed with a combination and the bracelets that came with it. Everything was tested and the safe worked. While on a road trip yesterday to Houston, TX, I loaded and secured the safe inside my vehicle and locked my pistol inside the safe. When I returned from the road trip, I discovered that the safe failed to open with the combination,neither with the RFID bracelet, nor the barrel keys that came with the safe. You could hear the mechanism run, but the lid would not open. In the end, the safe had to be cut open in order to retrieve my pistol.